The city of Petra lies hidden in a rugged area accessible only through a narrow pass between jagged cliffs of rose colored sandstone. Inhabited from prehistoric times by the Edomites, the glory of Petra flowered with the arrival of the Nabateans, whose new ideas and concepts in art and architecture, influenced by the prevalent Hellenistic culture at the time, gave rise to the spectacular monuments carved into the rose red mountains. A city intact with amphitheaters, houses, tombs, monasteries, temples, palaces, triumphal arches, all adorned with intricate sculptures demonstrates Nabataean skill at the art of sculpture, plaster and fresco work. This fortress city stands today as a silent testament to the ancient world that can be seen in Jordan. 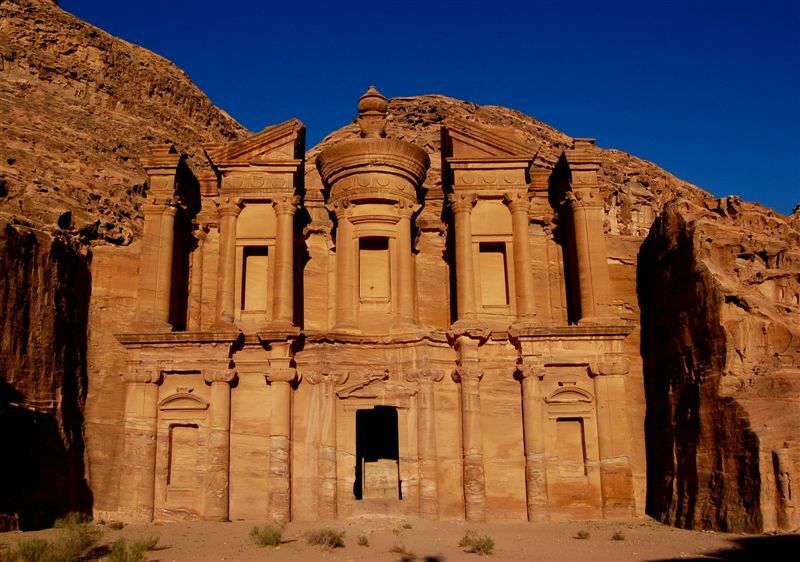 From the museum area the 45 minute ascent to ed-Deir is one of Petra�s most enjoyable treks, combining some of Petra�s important monuments such as the Lion Monument, Qattar ed-Deir, and the Hermitage. Ed-Deir is Petra�s largest facade. The modern name, ed-Deir (�the monastery�), is derived from several crosses scratched on its rear wall. Worshippers of priestly processions would have followed the ceremonial route through Wadi ed-Deir and assembled in the vast open area in front of the monument. Incredible light Moncef! Well composed architectural shot, good use of the polarizer and a very sharp sht, well done, thanks! Attractive architecture,Classic simple POV but So powerful feeling when look at,Well composition in symmetrical balance,Well arranged of light and color with crisp sharpness too.Good work,TFS. This is on my list of "places to see before I die"! Absolutely fascinating. The warm color of the mountain against the blue sky is breathtaking (so beautiful it takes your breath away). Great sharpness and details. well my dear, you captures it so great that I could watch Petra everyday! wow, excllent architecture photo, wonderful contrast, sky look amazing, great light and colours, bravo!!! nice architecture of old times. a blue sky background. lighting is perfect. great view....amazing blue sky and building! I will go there for sure..
kisses & love from Italy!! Great POV and colours and light; very strong composition and a very impressive effect. Thank you for show Petra so beautiful. For me see Petra alive is a big dream. Excellent colours and details. Nice framework. Just an amazing sight Moncef. against the vibrant blue sky. Seems you were in the perfect position for this. A full view this time with that same sun that seems to cooperate so well for you. Incredible architecture and you have rendered it perfectly. Love the sharp details here. You've caught every detail of this wonderful architecture. Very good composition and blue sky. This is pure beauty. wonderful capture. Excellent picture! Love the details of this monument and the contrast between the blue sky and the red stone! TFS and to show us a part of your beautiful country!